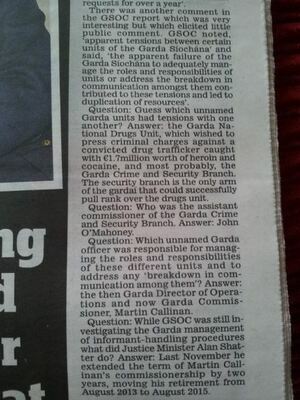 Cormac Lucey raises a few questions and proffers some answers in today’s Irish Daily Mail, in relation to the role of Justice Minister Alan Shatter, Commissioner Martin Callinan, and Assistant Commissioner John O’Mahoney (who incidentally carried out the penalty points report) into the investigation of the Kieran Boylan affair. It follows RTÉ’s Late Debate on Thursday night, during which host Audrey Carville spoke about these matters with John Mooney, of the Irish Sunday Times; chairman of the Public Accounts Committee John McGuinness; CEO of Transparency International John Devitt; and former detective garda inspector from Tralee Gerry O’Carroll. Mooney: “I just think it’s really important to point out this is not about civilian oversight or political oversight or anything else. These were a group of detectives operating on their own, in a charmed relationship with a drug trafficker. No one knew about this. It only became an issue when the good work of the Garda National Drugs Unit uncovered what was going on and this fella started issuing threats, one whilst in custody. If police officers, for example in Northern Ireland or Britain, engaged in this type of activity, they’d be charged with corruption. They run these trials in the UK, they’re very difficult to secure convictions against. They run them in America, they run them in Australia and everywhere else. And the police officers who step outside the line, in terms of their dealings with criminals are prosecuted for corruption and collusion and other offences. 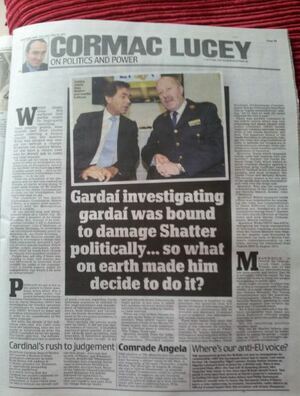 Posted in Misc and tagged Alan Shatter, gardai at 1:26 pm on May 18, 2013 by Broadsheet.